Euro Trophex 2018 is taking place in Berlin for the first time on November 3 and 4. 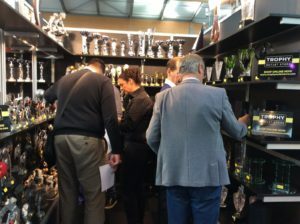 This year at the event you can meet representatives from all of the leading trophy and award suppliers from across the globe. You can take a look at the latest ranges, find unique products and consider new lines of business that may be beneficial to your customers. Robert Ebben, CEO of Biemans, a sponsor of Euro Trophex, said: “The move to Berlin has been an important step in the growth of Euro Trophex as a fundamental event for this industry. Embracing change and identifying the leaders and influencers in this marketplace is imperative in driving the industry forward. Biemans see Euro Trophex as a vital part of their global marketing strategy and are looking forward to appearing alongside some of the best companies in Europe. “If you work in this industry you should include Euro Trophex 2018 in your event calendar. Also at the show we will be announcing where in Europe the next Euro Trophex will take place in 2020!”. Visitor registration for the show is now open. Head online to secure your place.